Hot off a headlining date at Madison Square Garden, Queens of the Stone Age are taking Europe by storm for the month of November. 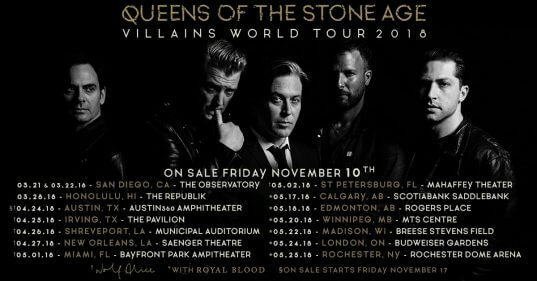 Josh Homme and company already have an enormous 2018 planned, beginning on the West Coast and playing in South America in February. Today, Queens announced Spring tour dates across the United States and Canada with openers Wolf Alice and Royal Blood. Tickets are on sale this Friday at 10am local time. Sunday, February 25 – Maracana Stadium, Rio De Janeiro ! Tuesday, February 27 – Allianz Parque, Sao Paolo ! Friday, March 2 – Pedreira Paulo Leminski, Curitiba ! Sunday, March 4 – Estadio Beira-Rio, Porto Alegre ! Wednesday, March 7 – Velez, Buenos Aires !